Tony Blair is on a world tour at the moment as part of the longest swan song in history. Today, former US President Jimmy Carter has condemned Blair's support for George W Bush. On this site you can see the names and pictures of the US dead. Irish people have experienced British interference for centuries, now the unfortunate people of Iraq have the opportunity to discover what that means. 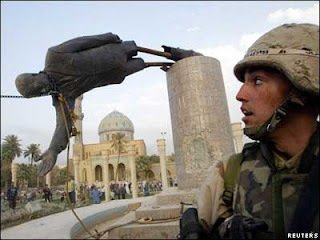 Iraq has been destroyed by the British and the US. Its a disgrace. The photo above shows a captured Iraqi soldier. 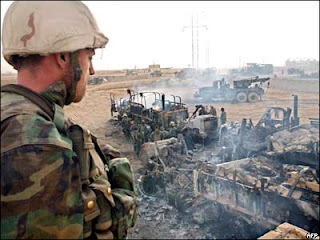 Blair and Bush entered Iraq on a "Get Saddam" at all costs agenda, now that he is dead they seem to have no plan for an exit. Blair will be remembered not as the reformer but as the war leader who blindly followed the Texan fool. 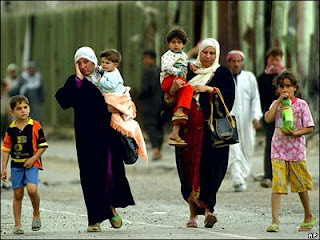 The Washington Post reports that civilian deaths in Iraq since hostilities began have exceeded 650,000.